For this double feature, we're going to take a look at two duos committed to protecting the world of the living from the insidious schemes of the dead, though each pair goes about it in radically different ways and with very disparate results. First we have The Conjuring, based on an allegedly true case involving Ed and Lorraine Warren, a married couple renown for their investigations into alleged hauntings and cases of possession. To discuss their careers will involve lot of usage of the word "allegedly" as many will obviously have doubts about the veracity of their exploits depending on their own unique beliefs. While I do believe in ghosts, the fact the Warrens supposedly verified claims regarding the Amityville haunting, which these days seems like a dubious case at best, give me pause. So going into this movie it's probably best to cast your particular beliefs or lack thereof aside and just regard the film as the first-class spook show that it is. Director James Wan, best known for kicking off the Saw franchise, showed his skill at producing intense scares on a low-budget with 2011's delightfully relentless Insidious and cranks things up even more here. After an opening scene demonstrating the Warrens at work and introducing us to one of the damn creepiest dolls in film history, the story settles in to focus on Carolyn (Lili Taylor) and Roger Perron (Ron Livingston) and their children as they relocate to a beautiful country house in Rhode Island. However, the odd quirks of their new home quickly escalate into alarming signs; the family dog won't set foot in the house; the children feel a strange tugging on their feet as they try to sleep; Carolyn develops mysterious bruises; framed photos fly off the walls. As events become increasingly hostile, the family turns to the Warrens for help. It's interesting to consider the story in the context of the time in which it is set. Fears of Satanism and the occult began to grow in popular culture during the 1970s, both through exposure in films such as Rosemary's Baby (and later The Exorcist and The Omen) and through the cultural perception that America had lost its moral compass in the wake of the counterculture. This mindset would expand into the Satanic ritual abuse scare of the 70s and 80s and the rise of the religious right. Through that prism, this case would have an obvious appeal, a tale of the American nuclear family being assaulted by evil that can only be defeated by clean-cut, God-fearing crusaders. 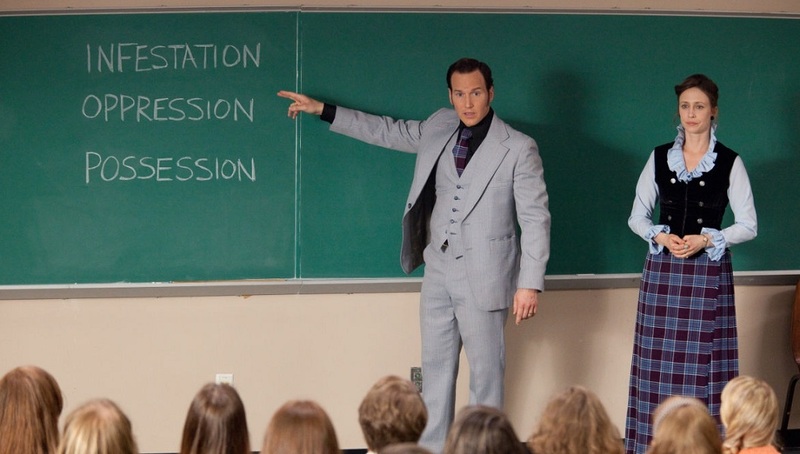 Though they follow in the hallowed tradition of such anti-demonic bad-asses such as Abraham Van Helsing and Lancaster Merrin, Ed (Patrick Wilson) and Lorraine (Vera Farmiga) project a slightly bland, folksy appeal, offering both the family and the audience a calming presence through their familiarity with this type of occurrence. While both approach the phenomena from a devoutly religious perspective, they deal with it with the measured professionalism of a profiler analyzing a serial killer, classifying each entity and documenting everything with the latest (for the 1970s) technology. It's interesting to see how the duo split the duties of their profession. Lorraine, a clairvoyant, focuses on empathic methods to determine what they're dealing and Farmiga is perfectly cast, expressing warmth and compassion while suggesting the heavy emotional toll the things she sees and feels take on her. Ed focuses on the more clinical aspects of investigation, setting up cameras and recording EVP tapes to find evidence. Wilson, back with Wan from Insidious, gives the role a coolly academic bearing while hinting at the concerns that plague him about Lorraine. One of Wan's best directorial traits is the canny patience he exhibits in many aspects of the narrative. He puts off the involvement of the Warrens in the haunting until almost the midpoint, allowing us to get to know and care about the Perron family as they endure a barrage of manifestations. It's great to see Lili Taylor, a mainstay of independent film in the 1990s, get her biggest part in years. She excels in expressing both the terror and desperation of her family's plight while the affable Ron Livingston keeps pace with her, conveying a father's frustration at being unable to protect his loved ones. Also, special mention has to go to Joey King as young Christine Perron for one of the most convincing and affecting portrayals of pure terror in years. All of their work feeds into one of the most interesting aspects of the film, the suggestion that the bonds of family, whether between wife and husband or parent and child, are more potent weapons against evil than holy water and crucifixes. That patience also manifests itself in how Wan sets out to scare us. Early in the film the Warrens lay out the stages of a haunting, noting how demonic forces establish themselves, wear their down victims through sadistic psychological torture and terror, then possess them. Wan almost seems to follow the same methodology, teasing us with tiny little signs of something amiss and slowly turning the screws as he creates moments of tension out of thin air, admirably not resorting to clumsy false scares. He doesn't let us see the entities tormenting the Perrons till far into the film and when we do, they are thankfully not the computer-generated monsters that commonly populate horror movies these days but are the kind of decaying ghouls that wouldn't be out of place in a William Castle movie. Wan also doesn't weigh the film with stylish camera tricks, saving them for key moments such as an ambitious tracking shot through the house as the Perrons first move in, setting up the household geography for what's to come, or a fantastic montage as the Warrens' assistant (Shannon Kook) sets up equipment throughout the house. The movie's period detail, from costumes to set design to music is pitch perfect and the music score by Joseph Bishara (who also appears as one of the ghosts), with contributions by Mark Isham, is very effective. The only real negative point, one that's a bit of a pet peeve of mine, is a connection to the Salem witch trials that once again misrepresents those events. It's one thing when Rob Zombie does it in Lords of Salem because he's making a satirical point, but attempting to suggest the accused witches of Salem actually were evil Satanists really stings, especially for a movie representing itself as a true story. But getting past that, Wan has again delivered a sleekly efficient scare machine. The tremendous collection of spooky objects that the Warrens keep under lock and key suggest a multitude of cases that could be fodder for sequels or prequels and while there's a great chance that the facts of those cases would probably get lost in the shuffle, it'd be fun to see the Warrens become the unlikely stars of their own franchise. A movie that would undoubtedly love to spawn a franchise and probably won't is R.I.P.D. Worlds away from the understated professionalism of the Warrens, the mismatched duo at the center of this comic book adaptation lack finesse or grace, but then in the cartoony world they inhabit, bonds of love and family aren't very effective against the dead, or as they're classified here, "deados." Instead, instant exorcisms are fired from the barrels of funky revolvers. 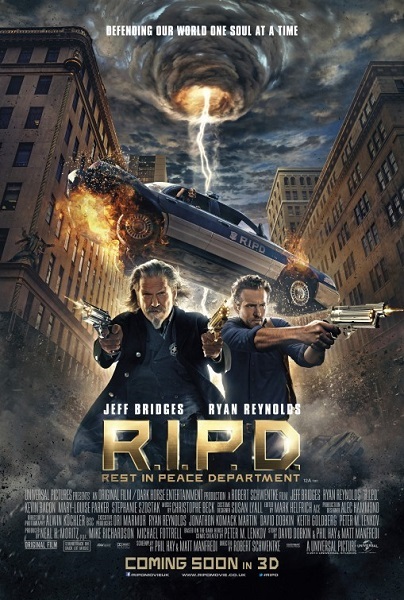 The shadowy terrors of the supernatural are reduced to a clunky, barely functional bureaucracy, as Boston cop Nick Walker (Ryan Reynolds) finds to his surprise when he's betrayed and killed by his corrupt partner (Kevin Bacon). The afterlife is an endless expanse of offices and filing, where Nick is informed that his participation in the theft of evidence has left him subject to harsh divine judgment unless he agrees to serve in the Rest In Piece Department, a division of deceased police who track down departed souls that have escaped the afterlife to hide among the living. Paired with old-school Western lawman Roy Pulsipher, Nick tries to use the opportunity to reach out to his widow (Stephanie Szostak) and attempt to avenge his own murder, but his unauthorized investigation uncovers a colossal threat to the living world. There can be some comfort in the familiar and to be sure, everything in R.I.P.D. 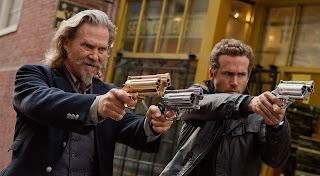 is familiar, from the standard mismatched buddy cop story it's built upon to the tonal similarities it shares with Ghostbusters and the steampunk gadgetry and aesthetics that have been borrowed from Hellboy. Its most obvious antecedent is Men in Black as both films share a self-satisfied focus on their own world-building. But where Men in Black's ideas seemed of a piece and cleverly corresponded to UFO mythology, the rules set up here are scattershot. There are some fun and logical concepts, such as how the presence of deados is a corruptive influence, allowing our heroes to track them based on the traces of decay they generate around them. 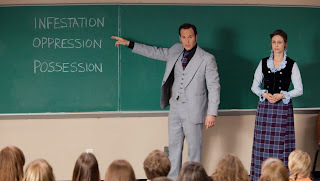 Unfortunately there are also elements that suggest the writers are barely trying, like the nonsensical detail that Indian food and spices cause deados to break out of their human disguise and transform into exactly the type of exaggerated CGI monsters that The Conjuring avoided. By the end, the script is spinning in circles and spitting out MacGuffins to circumvent its own established rules. One of the better bits is the conceit that both Nick and Roy appear as completely different people to the eyes of the living as a way of discouraging efforts to get involved in the mundane affairs of Earth. Not only does this mean we get a few scenes (still too few) with wonderful character actor James Hong (best known to film geeks as Lo-Pan from Big Trouble in Little China) as Nick's disguise, but it allows for one of the movie's best moments of humor as Roy, who takes on the outward appearance of a gorgeous fashion model (Marisa Miller), barks a practiced lecture at a sleazy lothario that fails to respect him as a woman. I find myself feeling a tremendous empathy for Ryan Reynolds, a charismatic leading man who can't catch a break, especially when he's starring in comic-book adaptations. He gave Blade: Trinity what little pulse it had, the Deadpool spin-off everyone expected after X-Men Origins: Wolverine never materialized and the less said about Green Lantern, the better. This isn't going to be the break-out role we'd all like to see him find either, though he does what he can in a thinly-written part that doesn't feel well-thought out. Though Nick's told he must atone for his crime on-the-job, that transgression really amounts to a brief moment of ethical weakness and one he seems ready to make good on just before he's killed. It seems disproportionate that he must pay such a heavy price, suggesting that in earlier drafts of the script he may have been less of an honest cop but that this thread was watered down to ensure Nick was likeable enough. A pity, since that would have given Reynolds something more to play with than the standard 'letting go' story he gets. Bridges meanwhile seems to be playing the afterlife version of his previous Wild Bill Hickock and Rooster Cogburn roles, a bundle of 1860s swagger and disdainful confusion regarding a modern world than doesn't appreciate the brutality of the West he fought and died in. Of course he is totally opposed to having a partner and gruffly suggests that Nick accept the misery of his new existence, a somewhat fatalistic attitude that's never really countered. The disparities between the characters and the styles of performance that Reynolds and Bridges give hinder the on-screen chemistry the partners should share. Their aversion to working together seems to get tossed aside once Nick seems to realize they're coming to the third act and should probably do something. The single most successful element of the movie is Mary-Louise Parker as Proctor, taking what might have been a trite role as the department's unforgiving commander and imparting a mirth and playfulness the movie could have used more of. Scenes become instantly more fun when she walks onscreen, giving even dry bits of exposition an extra charge with her restless body language and snarky delivery. It's a pity she never gets much of a chance to get in on the action. The other notable cast member is Kevin Bacon, who's oddly absent from any of the advertising. Bacon has the kind of easy presence that lets him fit into virtually any kind of role, whether heroic, villainous, or somewhere in between. While he certainly doesn't seem to pushing himself dramatically here, he always delivers when it comes to playing cocky, casual bad guys. Director Robert Schwentke is also responsible for 2010's Red, a fun if forgettable action movie whose sequel ironically enough opened against this film on the same weekend. 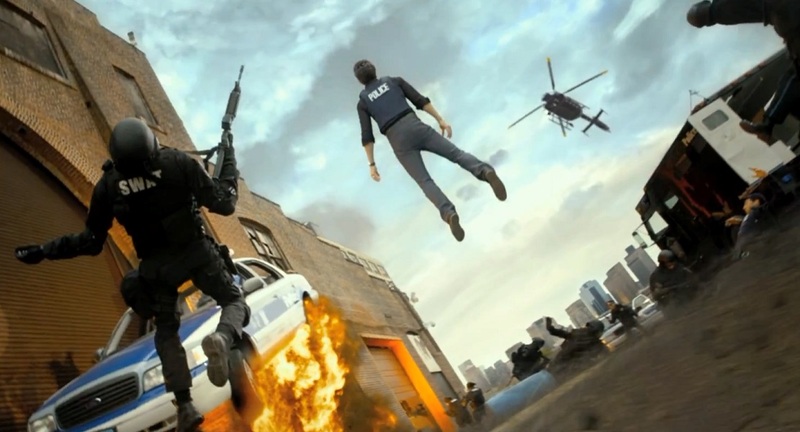 He shows some considerable visual flair, especially in the first act during a dynamic police raid and its surreal aftermath as the ghostly Nick stares dumbfounded at the battle frozen in time around him before he's silently pulled skyward into a swirling vortex. Unfortunately the extended chase and shoot'em-up scenes with the caricatured ghosts never have much weight, especially since being ghosts, our heroes aren't subject to the kind of bodily punishment that actions such as falling off a building would normally incur. Even when our heroes face a punishment of eternal oblivion for mistakes made on duty, neither the film nor its characters seem to be very concerned or interested and as a result, neither are we. At the same time, the climactic emergency that fuels the third act illustrates another unfortunate problem when it comes to action and particularly comic-book movies lately, in that the scale of these movies seems to demand that the fate of all humanity always be at stake. 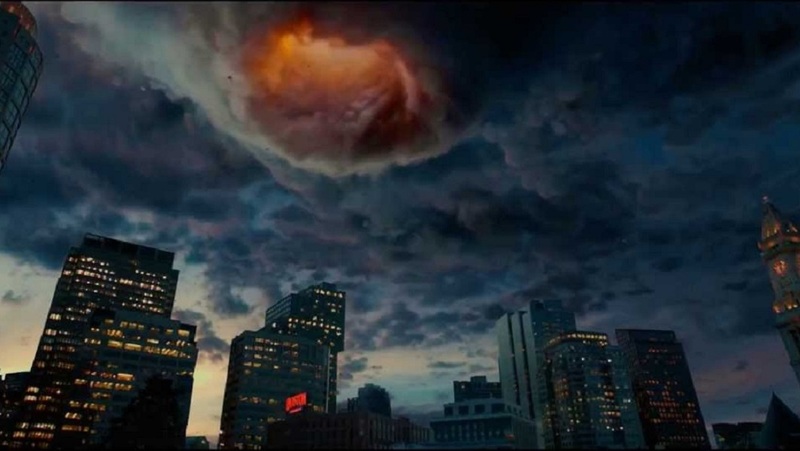 The movie could have gotten plenty of material from Nick's struggle to adjust to his new circumstances and succeed in his new post-life career, but instead there has to be yet another arcane ritual that will bring about yet another ridiculously apocalyptic threat. Being faced with the end of the world time and again has become troublingly reductive. R.I.P.D. does get some rather biased bonus points for me based on the fact that it's set in Boston and it's nice to see some of the town's landmarks, such as Fenway Park and the Hynes Convention Center make an appearance. A moment where Bacon has a package from local landmark Mike's Pastries got a small cheer at my screening. However, it's also makes it a bit more disturbing when the movie continues the collateral damage trend we've seen all summer, as that aforementioned catastrophe results in several buildings collapsing and imploding with little regard for the inevitable loss of life that would result, especially when it's all staged during what's supposed to be a comic action climax. I can't get behind the sentiment that R.I.P.D. is the worst film we'll see all year, as it's simply too insubstantial to be earn that distinction and it does have a few fun ideas kicking around within its tired premise. But with so many similar fantasy worlds hitting movie screens, it takes an extra effort to stand out and Schwentke and crew don't seem all that driven to try. It's destined to be the kind of movie you catch on cable some night and leave on as background noise while you're doing the dishes. So there you have it; if you're being troubled by ghosts, deados or just pissed-off demons, Hollywood has a few new options as to who you're gonna call. 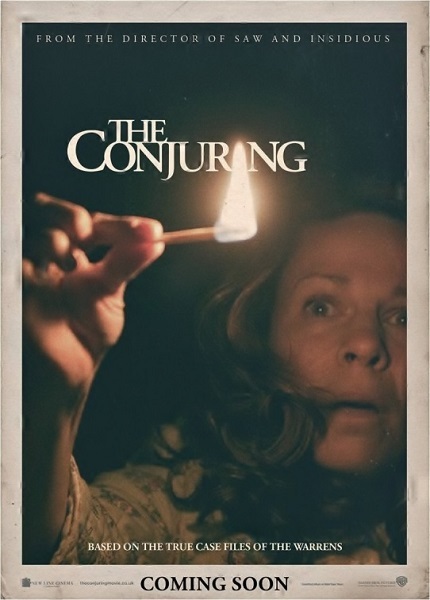 Be advised that seeing The Conjuring may result in some sleepless nights. Happily, R.I.P.D. may serve as a ready-made cure for that condition. Actually, you're right; it is supposed to be Rhode Island. My mistake. Let me fix that. I've seen pictures of the doll. Again, not sure just how much of the history behind it I believe but it is damn creepy.